People with RA are more likely to have arthritis in their wrists. Over time, arthritis may make it hard to bend your wrists or perform daily activities. 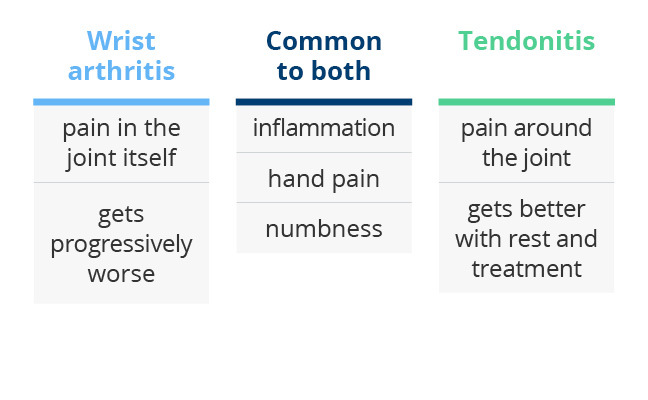 Not everyone with arthritis will have the same symptoms. Development of symptoms depends on the type of arthritis and how severe your condition is. RA tends to produce long-lasting stiffness, swelling, and redness of the joints. People with RA may also feel fatigue, general discomfort, and lack of appetite. People with mild arthritis also report that their wrist feels stiff in the morning. With rest, it may feel better by midday, but it could be painful again by nightfall. Activity can also cause pain to come and go for days or weeks. With moderate arthritis in your wrist, you’re likely to tell your doctor you feel a low level of throbbing at all times. Movement may be slightly restricted and daily tasks may also become tricky. You may even feel pain when you’re resting. Time may pass before another flare-up, but the flare-ups can be worse each time. Signs of the effects of inflammation will also become more obvious. Your wrist may swell and be tender to the touch. An X-ray may reveal a loss of joint space. You might have severe arthritis if almost any activity hurts your wrist. For severe and chronic cases, you can still experience flare-ups, but the pain is typically constant, even at rest. You will also experience decreased motion in the area and a physical deformity may be more noticeable as your tissues wear down. You may not even want your doctor to touch your wrist during your exam. Severe arthritis can be painful to a point where you need prescription drugs to help manage it. The pain can also cause anxiety and depression, making it difficult to exercise or focus on other things. Is wrist arthritis causing my symptoms? 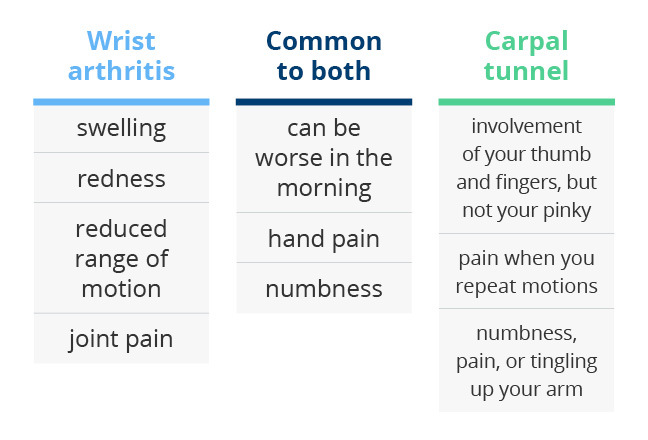 In the early stages, symptoms of wrist arthritis can be similar to carpal tunnel syndrome or tendonitis. Arthritis can raise the risk for both conditions due to inflammation. Talk to your doctor if you’re showing other symptoms that don’t fit with wrist arthritis. First, your doctor will ask about your symptoms and medical history and perform a physical exam. During your physical exam, your doctor will examine your wrist for swelling, pain, and tenderness. The location of the swelling can tell your doctor which wrist joints are most affected. 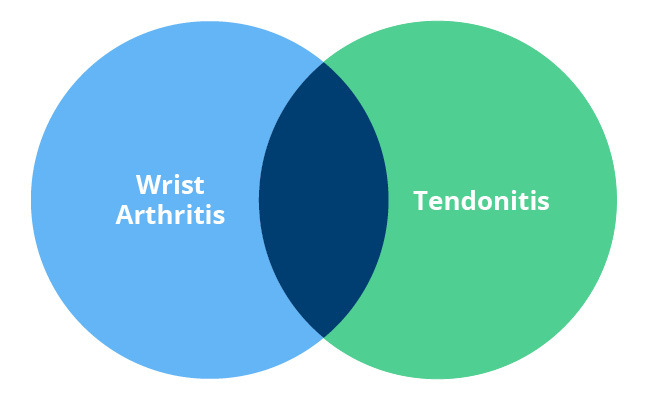 Problems in the wrist can affect peripheral tendons, causing tendonitis. Next, your doctor will examine the range of motion of the wrist itself. 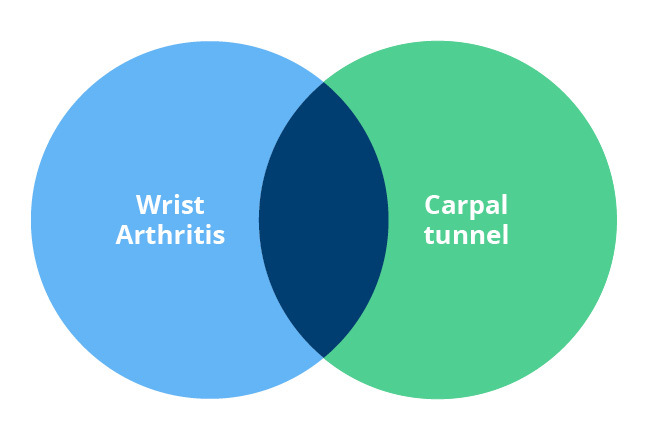 This can show how mild or severe the arthritis is, or if you have carpal tunnel syndrome. Your doctor will ask you to twist and flex both wrists in every direction. Finally, they’ll manipulate your wrist and thumb joints and ask if you feel pain. If your doctor suspects you may have arthritis, they may also do X-rays and blood tests to see what type of arthritis you may have. Blood tests that show antibodies known as the rheumatoid factor or anti-citrullinated peptide/protein antibodies indicate RA. How do you treat wrist arthritis? Arthritis doesn’t have a cure but treatments can help manage your symptoms and relieve pain. You can also try limiting activities that cause pain in your wrist, if possible. A splint may help with this, as it eases physical stress and provides support. You can order a custom-made splint to cover your wrist and forearm or get an arthritis glove. These allow you to wiggle your fingers. Nonsteroidal anti-inflammatory drugs (NSAIDs) decrease inflammation in the wrist joints. Aspirin and ibuprofen are both NSAIDs. There’s also anti-inflammatory gel, which doesn’t have the side effects oral medication may have. If you have kidney insufficiency or gastrointestinal problems, your doctor won’t likely keep you on NSAIDs for a long time. If you have severe acute flares from your arthritis, steroids may be in order. A prescription of a steroidal drug called methylprednisolone may be given as a pulse treatment with a tapering dosing schedule to help address your pain. If your symptoms are moderate or severe, your doctor may offer you steroid, or cortisone, injections. These injections provide anti-inflammatory effects. They can bring relief and improvement in arthritis symptoms. But these effects may only be temporary. If you’ve tried all these methods, your doctor may suggest that you progress to others. More advanced treatments, especially for rheumatoid arthritis, include disease-modifying antirheumatic drugs (DMARDs), which are now used very early in treatment and on occasion as first-line therapy. If surgery is indicated, a surgeon can remove bones, fuse bones, or replace them in an attempt to decrease pain and, in some cases, increase function. Exercise: You can exercise your joints at home to encourage a full range of motion in your wrist. Do these hand exercises gently every day for the best results. Hot and cold therapy: Applying heat or ice to the affected area helps reduce pain and swelling. Herbal supplements: Some supplements can help with pain and swelling. These supplements include capsaicin, turmeric, fish oil, and more. Read about the herbal supplements for arthritis here. Other natural remedies may include meditation, acupuncture, and massages. Click here to read what research says about these treatments.